When Brad Loyet was sitting in the hospital less than a year ago, right wrist shattered and his hand just hanging on as decoration, he knew he’d never race again. Loyet told his family as much at the time. 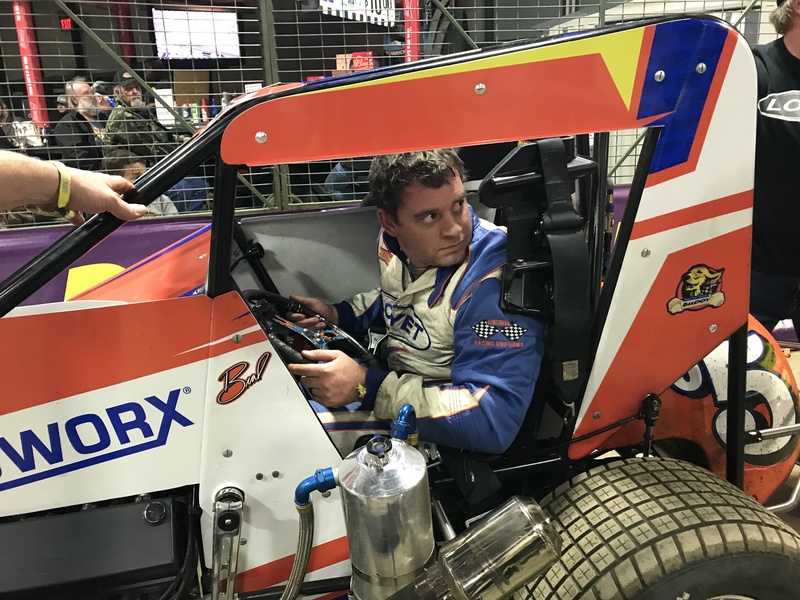 But as this year’s Chili Bowl approached, the 31-year-old made what he called a “selfish” decision: He called officials in Tulsa and told them he was getting back into a car one last time. The thing is, Loyet still isn’t 100 percent recovered from his fluke accident last year. Actually, he’s not even close to healed. It didn’t turn out that way. Six weeks after the surgery, Loyet still couldn’t even feel his hand. A specialist in St. Louis told him further surgery might only do more damage and suggested Loyet just learn to live with his handicap. “I told myself, ‘Let’s just make the best of life at this point,’” Loyet said. “I want you to go see one of my guys,” Stewart told him. So with Stewart’s help, Loyet got in to see a specialist in Indianapolis — who promptly discovered the bones were not only still broken in Loyet’s arm, but the plate holding them all together was flexing and about to break. Loyet had additional surgery on July 5, where doctors used a bone from his hip to strengthen the arm. And while it’s helped stabilize his wrist, Loyet still can’t bend it and thus has no grip strength in his right hand; he’s scheduled for another appointment next month, where the prospect of additional surgery looms. With Loyet still dealing with the fallout from the shop incident in his daily life, the decision to stop racing was pretty obvious. But three weeks ago, Loyet decided he didn’t want his driving career to end without a proper goodbye. So there he was Friday night, strapping into a car for his heat race at the world’s most prestigious midget race. Loyet started seventh and finished third in the heat, then started at the front of a B-Main and nearly won it. His arm ached badly with every lap, and he mostly just rested it on the wheel rather than use it to steer. “Every time my heart beats, I feel my hand take a hit,” he said. Despite that, the mere fact Loyet made it to the A-Main was a victory. More than 70 cars were entered on Friday night, and a one-armed driver who hadn’t raced in a year made it to the top 24. “Not too shabby,” Loyet said. Now, regardless of how he does in today’s Chili Bowl Nationals, Loyet gets to leave racing on his own terms. He starts 10th in an E-Main today, but that’s more than he could have hoped for last February. Stewart, standing in the infield, was impressed as he watched Loyet race. “That shows you how big of guts he’s got,” Stewart said. “He picked the toughest race of the year, where’s no spot on this racetrack to take a break. Great story Jeff – tugged at my heart! I’m glad you’ve discovered open wheel racing – hope you stay around! I agree with Denice… Great story and well told. Also, typical Tony Stewart reaction to something he sees that is unjust or stupid. I’m sure the “Big Two” American series are amazed at the crowds and lack of empty seats at events like the Chili Bowl. What they don’t realize is that every weekend there are 100 tracks across the country that are packed with fans watching winged and non-wing open-wheel racers on both dirt and pavement. Why? Real close racing that a family can afford. What a beautifully written piece Jeff. You always bring out the story behind the story. Thank you for telling Brad’s story. I’ve seen his passionate talent for years and was devastated to hear about the accident last year and his complicated recovery. When he announced he’d run Chili Bowl , I just hoped the racer in Brad would better the patient still recovering from massive injury. So glad Brad Loyet is still Brad Loyet.